4K content, and it’s availability, has increased many fold from just a few years ago. Now, with the many movies being released in 4K Blu-ray for the new generations of 4K Blu-ray players, projectors have been the focus of much attention. Why? 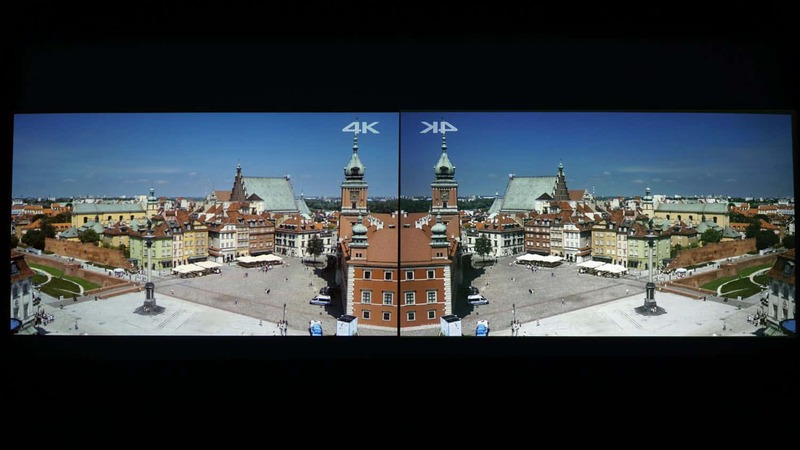 Projection of 4K content allows the size of the image to allow the viewer to actually see the additional detail, color, and contrast range the new format offers. So it was no surprise that when Optoma announced their first under-$2,500 4K UHD projector (UHD65) there were many eyebrows raised and skeptics, myself included, about just how well this new DLP chip could do in reproducing the additional detail of 4K content. And now with the release of the laser version, the UHZ65, there are many forums, on-line discussions and even reviews which continue to debate if this DLP technology can equal or come close to the “native,” or true 4K, projectors like these Sony projectors. So who is right? Is it a smoke and mirrors illusion, or a truly amazing technology breakthrough? Here are the images and technical information – you be the judge! VPL-VW385ES with 3 SXRD refelective imagers, and on the right is the Optoma UHZ65 with a single DLP UHD imager. Because these comparison take into account at least three interactive, and somewhat subjective, menu adjustments, we used the Spears & Munsil HD sharpness control guidelines and disc to make sure we did not over-enhance edges to the point where visible white edges appear. We also first optimized the blacks and contrast as outlined above to ensure best contrast was obtained for both projectors. Even though resolution, which is the actual number of pixels delivered to the screen, is very similar if both projectors are using a 4K UHD sources (3840 X 2160), contrast and edge sharpness still play a huge role in the perceived detail and overall image sharpness. Below is a close-up of the above side-by-side so you can more closely examine the fine detail. To fully see the detail comparisons, it is most helpful if you right-click this image and open, or click to see at the image at original size. 385ES on left UHZ65 on the right. Compare the stairs and people just below the isolated tree by the side of the building. Which is sharper? Most would say the Optoma clearly has more detail sharpness and resolution in the stairs. Compare the upper center roof area with the very fine line shingle tiles in the upper center of the picture. Which is more detailed? Most would say here that the smaller pixels of the Sony are clearly better than the Optoma. 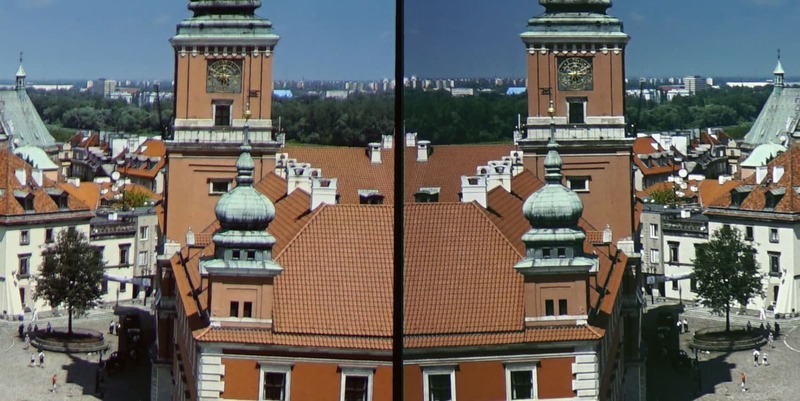 Compare the two clock faces. Which is clearer or looks better? Some will say Optoma, some will say Sony. Why? The Sony has finer detail but the Optoma has more contrast and apparent definition, we get both preferences on this one! Compare the detail in the dark green trees toward the center top of the image. Which has more detail? Most would say clearly the Sony has more detail and definition on the trees on the left side. Hopefully, this will give you an idea of why there is so much controversy in this debate of projector technology. We will be doing more comparisons in the future, but it is interesting to note that some projectors, most notably Epson and JVC, use another technology to deliver 4 million pixels to the screen but can still look very good depending on screen size and distance from the screen. They start with half the number of pixels that the Optoma does, and by delivering essentially half-UHD resolution it can look considerably better than many HD projectors. Our experience so far concludes that they are better than HD projectors and look amazing, but when it come to fine detail, because of the size of their larger pixels, they cannot display the level of both detail and fine resolution that you are seeing here from 8.3 million pixels. Here is another highly detailed scene from a true 4K UHD source. 385ES on left UHZ65 or right. Close up of the above image. Right click or expand to original image size to compare. Compare detail inside the two large triangles at the bottom center of the image. Which is better? Most would say the Sony has more fine detail – do you agree? 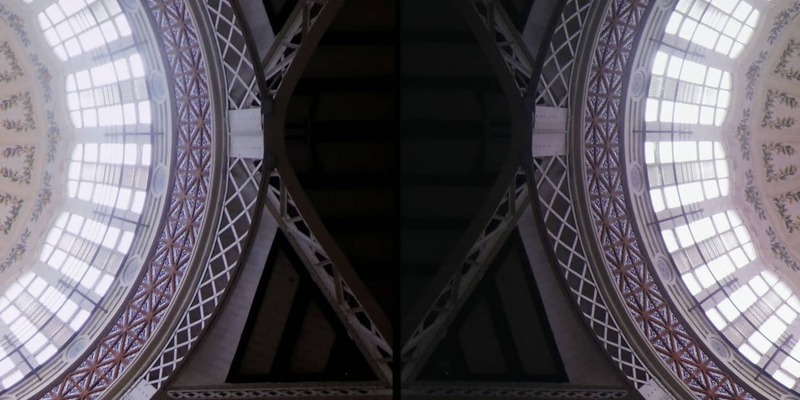 Compare the fine louver lines inside the bright parts of the dome, which is better? Most would say the Optoma has finer detail or sharpness – do you agree? Compare the fine leaf detailing on the far left and right center of the dome. Which is better? You decide. That is definitely the question being asked and debated all over the internet and in showrooms all over the country. 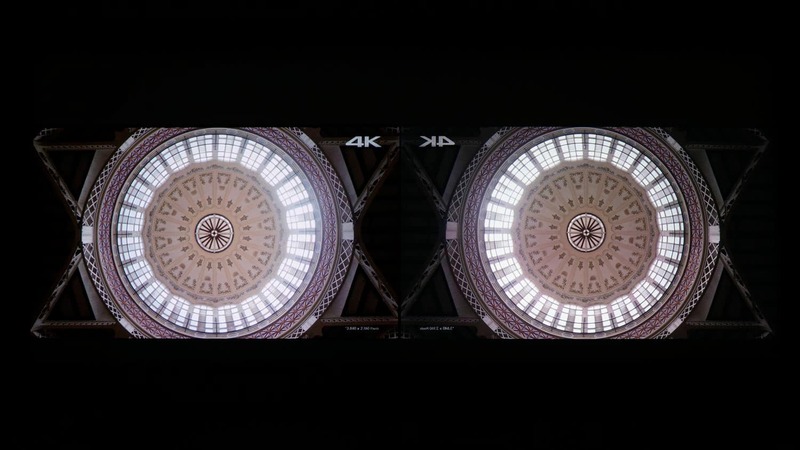 The term Faux-K has been used to describe the projectors that use 1080p chips and increase the number of pixels on the screen by a process called e-shift or 4K enhancement. They can, as we discussed above, look very good, but they will not pass the more technical tests for on-screen resolution below. Since these projectors compared here all claim true UHD 4K resolution on the screen let’s take an even closer look. between the two projected images. Use the close up image below of the center area to compare. As detail increases (increase in frequency) towards the center the sample width becomes smaller. Click the image and open to original or full size to compare. When the lines become smaller and smaller, and closer and closer together, it is more difficult, both for the electronics and for the display, to keep the depth of modulation high. The depth of modulation is a term used in digital cinematography to help understand the roll-off or decrease in visibility in high frequencies. The black lines become less black and the thin white lines become less white until they eventually roll off or turn to grey. 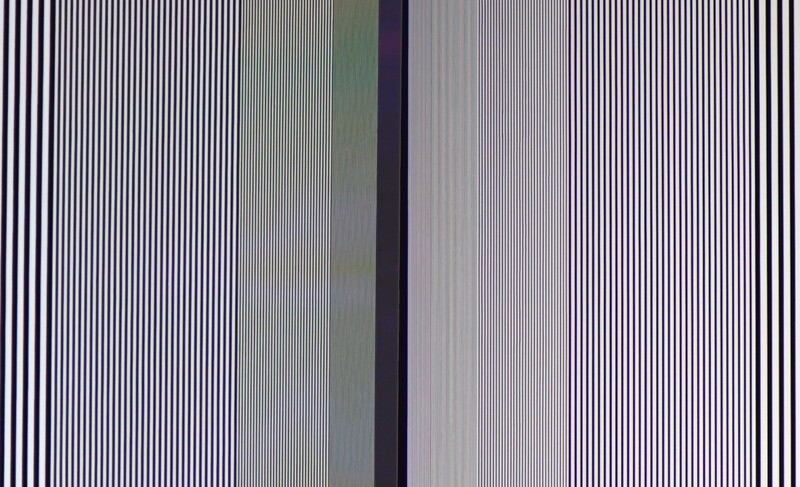 Even though the very last series of lines next to the center above appear to be dark grey and light grey on this image, in person at about 6 inches from the screen you can actually see some fine detail in each. Which one is better? You can decide, but based on the images and comparisons we’ve done, it really does depend on the specific scene. It is also clear to us that anyone who calls this new DLP chip Faux-K and not true UHD has not seen it compared with true 4K. The reality is that they are both doing a very good job at resolving the detail and frequencies that the human eye can resolve at proper viewing distances. (significantly better than full HD). As good as the extra detail and resolution that 4K has, for me, the real exciting aspect of 4K is the capability (in some 4K models) of High Dynamic Range, or HDR. HDR is actually a really big deal if done properly, as it will give you an expanded color gamut (color that could not be displayed electronically previously) and a huge increase in the total dynamic range, or full tonality of the image. It is best achieved with a source quality of 10 bits 4:4:4 color sampling, and REC2020 color space. For now, the highest quality is a 4K UHD Blu-ray with 10 bit encoding and 4:2:0 sampling and REC2020 color. The HDR gives you a range of brightness and color that is simply not available in standard dynamic range (which we are all used to). The additional highlights, mid-tones, dark detail, and expanded color are truly an amazing experience when done right. Some have said that HDR is not really very good on projectors yet, but I disagree. Let’s look at the results and compare the HDR characteristics on the projectors we have discussed here. Here is HDR Content from Guardians of the Galaxy II, in a dark room and at sizes of about 150″. The Sony VPL-VW385ES, VPL-VW-285ES and Optoma UHZ65 projectors each gave an amazing (better than most commercial theaters) performance. Click on the image and look closely how they differ.They are different due to tone mapping and brightness capability. Hint: look at the illuminated flooring just to the left of Yondu’s head; also the red color just above his head. All of the above projectors we have discussed have the capability of displaying HDR 4K content. Each projector automatically detects the HDR meta data and changes its internal settings to HDR mode. Any adjustments or changes to the image in HDR mode should affect only the HDR sources and not the HD or 4K without HDR sources. What we cannot show you here is how well the HDR content really looked, because there is currently no HDR standard for photographic stills on the internet – but at CES 2018 there are standards afoot that could change that. For now, the best way (other than in an in-person, side-by-side) is to view our 4K HDR comparison video on a 4K HDR display which is scheduled to be up by the first week in February. For now, I will try and describe what we were seeing on each scene. Since the actual performance for full HDR and the full REC2020 is currently unobtainable by any currently available display under $100K, each manufacturer must do their best at applying a process called “tone mapping” to enable their display to apply the values they can do to the content that includes the HDR capability. What is so interesting to the image above is that when it is captured in standard dynamic range you are not seeing many of the differences because they are lost. The detail in the blacks of both images are lost here as well as the intensity of the highlights, which is very dramatic in person. Because the blacks are crushed and/or compressed when trying to capture for the internet, you are also not able to see the mid-tones and full range of tonal values because the standards and technology for HDR stills and computer monitors are not completed yet. An idea of the expanded colors and how each manufacturer chooses to map their colors to REC2020 can be seen here. Each is different but unique to their projector and fans will be found on both sides. Notice here for the first time the blues look even brighter on the Sony. When it comes to HDR performance, brightness capability is a huge factor. Why? because the brightest parts of the image (theoretically up to 10,000 nits) can be mapped to a higher value than a projector with less brightness. So in this case, the Sony has the better blacks (low end of HDR) and the Optoma has the brighter capability at about 2,880 lumens. Both do a great job; both have color that exceeds the REC709 HD standard; both do a more dynamic presentation than any HD projector we have seen; and both have great detail and sharpness. The Sony is a little more conservative on the HDR tone mapping; Optoma goes a little further because it is laser and has higher overall brightness capability. Here is an example of the difference in HDR tone mapping between the Sony VPL-VW385ES and the Optoma UHZ65. The Sony is a little more conservative, the Optoma is a little bit more extreme. The standards for tone mapping is up to each manufacturer on how they decide to apply it. So, how do the three projectors compare overall? If you have gotten this far you will have already formed your own opinion. We would caution you against that because as interesting as you may find these comparisons, they are simply not the same as seeing them in person. It may take some checking around but we would highly suggest you find a dealer who can show both of the projectors you want to see compared. Check to make sure they are in similar color modes and calibrated (if possible); if not calibrated, check to make sure that the settings for each projector have been optimized. Optimization of these new combination settings goes beyond calibration and comes only through much time and testing on each projector. Without question, the Sony VPL-VW285ES and the Sony VPL-VW385ES have the deepest blacks, however that applies only in the darkest of dark scenes; as the image content increases to 20% or 30%, the Optoma UHZ65 is equal when it comes to overall contrast. Color is too close to call, as is the detail and resolution. Each has its advantages and disadvantages in HDR, as pointed out above. If your use would include 3D content, or serious online gaming, Sony is your clear choice. If you are interested in long term brightness stability, and not having to replace expensive lamps, then the Optoma UHZ65 laser projector is your clear choice. Both brands also have a full line of 4K projectors and we hope to be comparing some of those in the future as well. Please let us know what you think in the comments, and be sure to watch the 4K YouTube video version of this comparison as well! Below are the Theo-Charts of each Sony projector overlayed on top of the Theo-Chart for the Optoma UHZ65. To see additional projector Theo-charts and compare them side-by-side, simply hover over “Home Theater” from the main menu and select “Home Theater Displays” and then click on “Projector Comparison Charts”, Or click here. This entry was posted in AV Solutions, Home Theater and tagged 4k, 4k hdr, Faux-K, HDR, High Dynamic Range, optoma 4k projector, optoma laser projector, optoma uhz65, projector comparison, Sony 4k Projector, Sony projector, Sony projectors, Sony VPL-VW285ES, Sony VPL-VW385ES, Sony VPLVW285, Sony VPLVW385, true 4k, uhz65, uhz65 comparison, vpl-285 comparison, vpl-vw385 comparison, VPL285ES, VPLVW386ES. Actually we are just finishing up our comparison of the Epson 5040 / 6040 and the UHD65 along with the JVC LX-UH1, our first triple / quad comparison! We actually do a four page set up for the UHD65 and UHZ65 which we include with every one we sell from TVS Pro. The JVC mid and high end DLA projectors are the best blacks, however just like the Epson when it comes to blacks in a normal or bright scene then the native contrast is most important as light dimming and the use of an iris actually dims the the highlights and bright areas as well. This is what the Epson and Sony do as you will see in this next video. The Optoma competes very well in most scenes with the 5040 / 6040. Hi Ted, what is the calibrate setting that you used on the sony 385es? 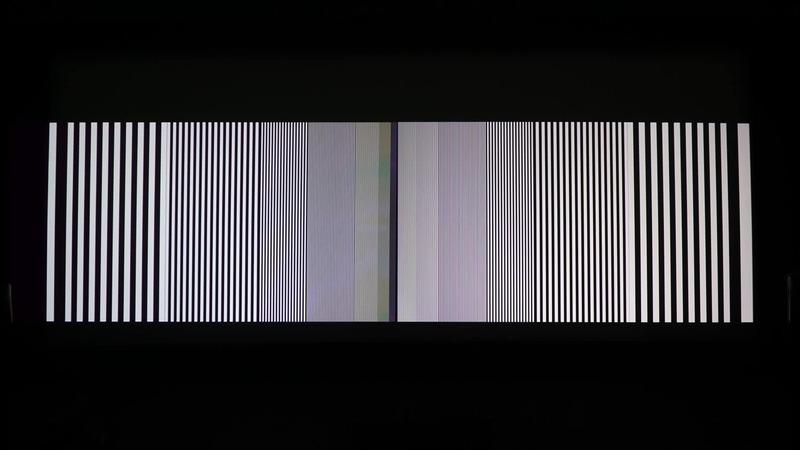 Since each projector is unique we do not publish the calibration settings as it could actually make your projector worse. Sony however comes from the factory with very good calibration settings and usually Film 1 or Film 2 is a good setting. If you want to do a basic set up we would suggest the Spears & Munsil setup disc volume two as it has all the good basics including the blue filter for color hue or tint. Here is my question should I sell my Sony VPL-VW350ES and purchase the VPL-VW285ES or the OPTOMA UHZ65? Which projector and if you should change now depends on your application and reason for change. Are you a gamer?, do you want or need 3D? Are really good blacks important to you? etc. If you have these and other questions you would like to discuss further, call 801 486-5757 and ask for one of our home theater specialists and they would be happy to discuss with you. Thank you for your comments, we were actually going to do a 5040UB comparison but we noticed the ProjectorCentral has now posted one which is very close to what we found.. That is at 4K and especially 4K HDR content is is not really a contest, as the Optoma will compete and equal or exceed performance with some of the best projectors in that space. If you need 3D, motorized lenses, or competitive gaming speeds then Epson is the best choice. Even though blacks at almost a full black (90% black and more) the Epsons do a great job as do the Sonys. As soon as you have a scene with more than 10 -15% illumination then the Optomas can compete with the best. Were also waiting for the new firmware updates and depending on what we find we do hope to do another Epson vs Optoma comparison in the next couple of months. I found your comparison of the UHZ65 to the Sony VPL-VW385ES extremely interesting. I have heard that the UHZ65 has outstanding black level capability and has specific settings for black level. Seem your comparison here, as opposed to your earlier comparison of the UHZ65, seems to bear that out. I recently read a review – sans images – of the UHZ65 with the JVC RS440U and for overall picture “quality” both seemed to be on the “same level” per the reviewer, however, the JVC did take the “prize” for better intrinsic black levels, not to mention that it has lens memory, motorized, zoom, keystone adjustment and wider throw range than the UHZ65. Were it not for the outrageous cost of a replacement lamp ($599), the RS440U would be the better choice if all the other things missing in the UHZ65 mattered. Of course, JVC is renown for its black levels, so I was not so surprised. But I have to wonder if the optimization of black levels on the Optoma is more difficult than it should be for the average purchaser. It’s pretty clear you guys know what you’re doing (and saying) but unless I missed it somewhere in your comparison, I was wondering if the UHZ65 was optimized professionally by your in-house ISF Certified tech familiar with the peculiarities of UHZ65 for the comparison with the Sony? Now I think what would really be a kicker is to do a comparison of the UHZ65 to the Epson 5040UB (or 6040UB which is supposed to be ISF Certified) even though the 5040UB is almost half as expensive as the UHZ65, and mostly because the 5040UB has gotten such rave reviews from all corners of the galaxy so to speak, often claiming it has a picture that you don’t get even from projectors costing two to three times as much. Please consider such as review. In the meantime I look forward to the video associated with this comparison review. Thanks for the extremely interesting and detailed review !